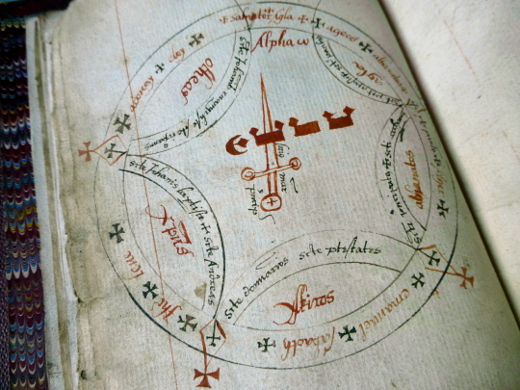 This curious manuscript, written mainly in English, is a grimoire, or magical textbook, containing prayers, invocations, exorcisms and conjurations together with mystical diagrams inscribed in circles. 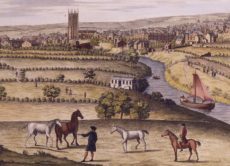 There are bizarre references to the ‘Queen of the Phairies’ and the ‘Sisters of the Phairies’ as well as directions intended to lead the reader to hidden treasure. 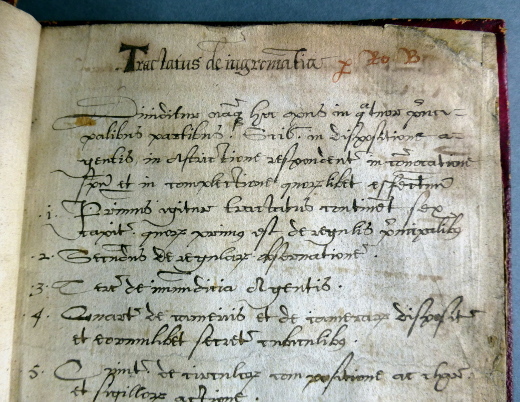 The first half of this 150-page manuscript is based on De Nigromancia, a Latin text (falsely) attributed to the 13th-century Franciscan Roger Bacon, which contains detailed instructions for conjuring the dead. The manuscript includes several lists of names and magical alphabets as well as coloured diagrams. As any reader of Harry Potter might know, these handbooks were vital tools for learned scientists/magicians who hoped to call up spirits and daemons in a quest for scientific and theological truth. 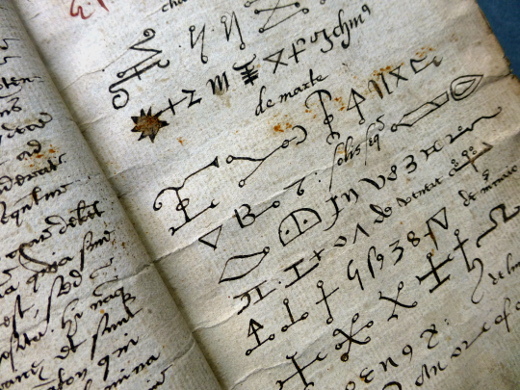 Although relatively few copies of these manuscript grimoires survive, perhaps because they could be considered dangerous and heretical to own, many Renaissance men of learning would have their own handwritten grimoire, since part of each spell’s efficacy was said to be conveyed through the act of writing it down. 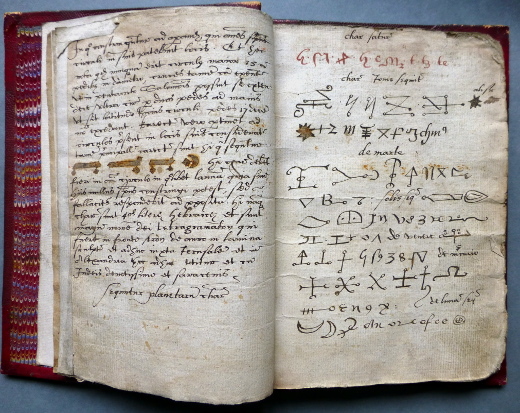 Chetham’s manuscript Mun.A.4.98 did not belong to John Dee but found its way to the Library through the collection of John Byrom (1692-1763), another scholar whose deep religious belief led him to an interest in the cabbala, magic and the occult. 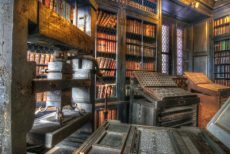 Best known today for his hymn ‘Christians Awake’ and his early system of shorthand, Byrom, too, was a bibliophile whose collection of 2,800 books and 40 manuscripts were given to the Library after his death. 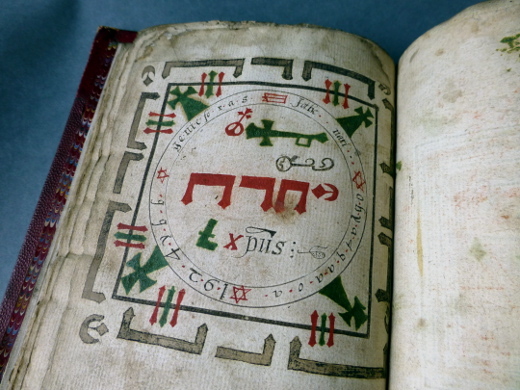 In addition to this grimoire, his collection also includes a number of books on magic and the occult including Dee’s Monas Hieroglyphica, the 1564 book in which Dee explains the meaning of his esoteric symbol said to embody the cosmos.